Sir Francis Chichester once observed that crossing oceans was easy, it was only the hard bits round the edges one had to look out for. There is perhaps no need to point out that in a typical canal there are rather a lot of those hard bits, and when the wind starts to blow with sufficient force that white caps appear on a body of water barely fifteen metres wide, some concentration and a little boat speed is required to stay in the wet part. If one were to slow down for any reason, for instance were one to discover a hotel barge pottering along ahead at her normal cruising speed of about half that which is required to provide directional stability things could get quite tricky. 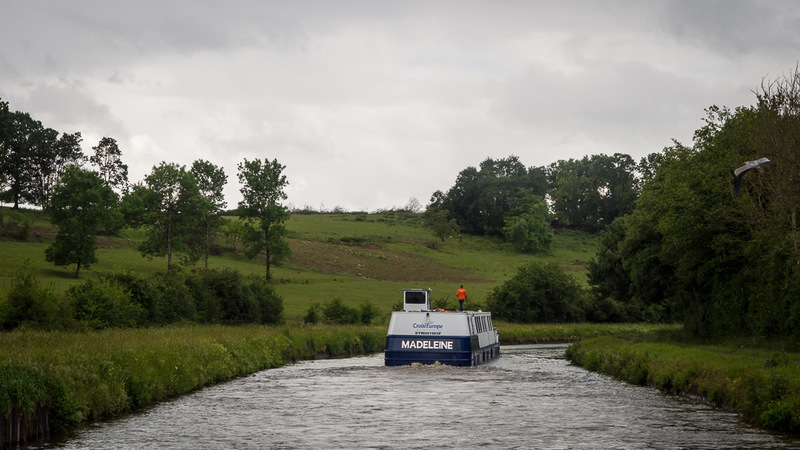 When we caught up with “Madeline” lumbering down the canal today impeding all progress behind, there was logically only one way of dealing with it. So we stopped for for lunch. We did make it unscathed though at the end of the day, home to Lagarde, a little windblown and rain washed from the persistent squalls, but we are home again none the less.